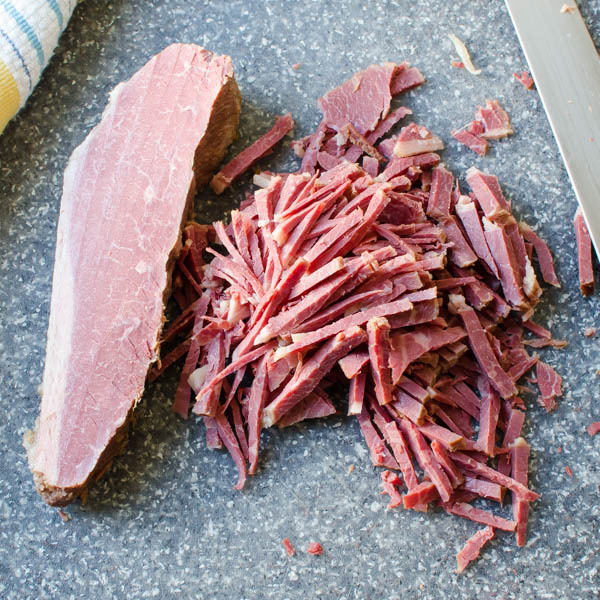 Struggling with what to do with your leftover corned beef? 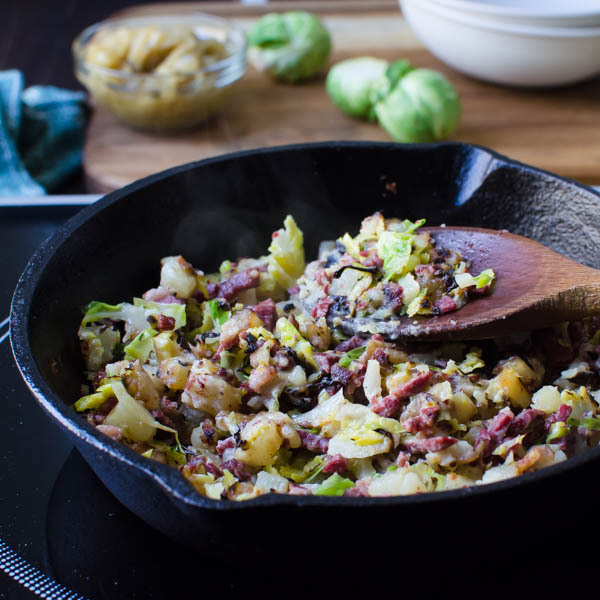 This easy corned beef hash recipe has sweet caramelized onions and shaved brussels sprouts in addition to the usual suspects. A great idea for weekend brunch or a quick weeknight dinner. 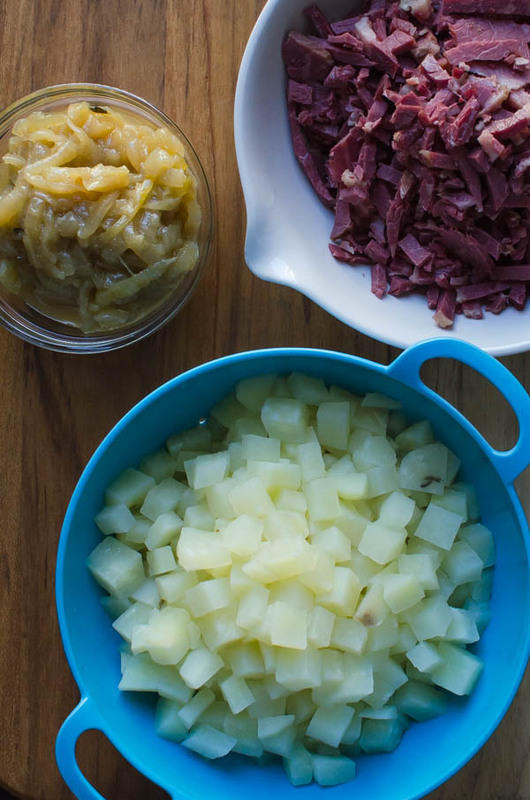 Initially, when I envisioned this corned beef hash recipe, my intention was to make a traditional corned beef hash. You know, crispy potatoes, pan-crusted corned beef with a poached egg on top. The kind you get when you go to your favorite diner… I was set to go until I started pulling ingredients out of the fridge and realized that OOOHHHH — I had brussels sprouts and oh, yeah – caramelized onions… and my authentic corned beef hash took a decidedly different route… Corned Beef Hash with Shaved Brussels. And those alterations make this hash a bit different from other, more mainstream varieties. Different because the flavors of this unorthodox hash are both sweet and bitter, salty and creamy. 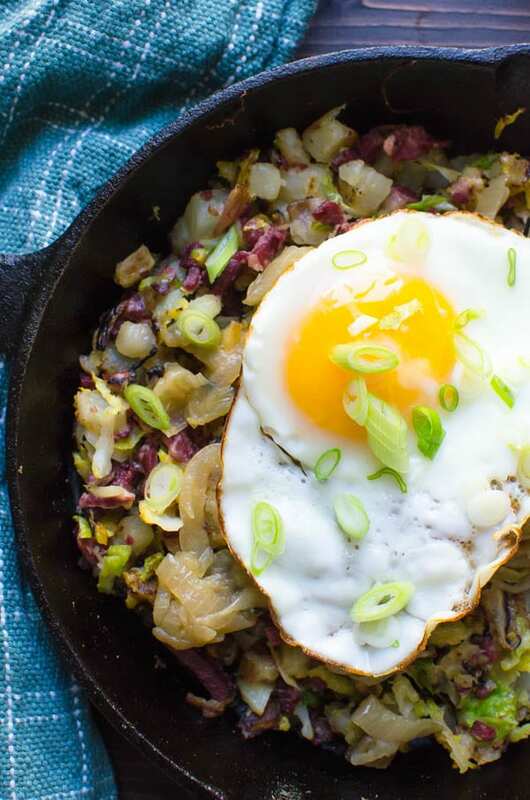 The brussels sprouts and caramelized onions add dimension to the hash but when I brought the skillet to the table, my husband said, “This isn’t hash.” Shoulder sag. For him, the offending interloper was the brussels sprouts. Even though I sliced them thinly (very hash-like). He was shaking his head as he trepidatiously scooped up his first bite. He didn’t have a problem with the potatoes or corned beef and certainly not with the caramelized onions (who could ever hate on those?) Yep. It was definitely the brussels sprouts. He thought I was trying to health-i-fy his hash. For me, the flavors were more complex. Deeper. To each his own, I guess. However, when you’ve been married as long as we have, you let those little quips roll off your back. I wasn’t making another meal. THIS WAS DINNER. And after a few bites, not only did he get used to it… he cleaned his plate and asked for more. (eyes rolling emoji). I was going to make poached eggs to crown the hash, but there’s something about a sunny side up egg that makes the whole dish more festive. If you prefer over easy, poached or even scrambled — I’m not the food police… Do what you like. 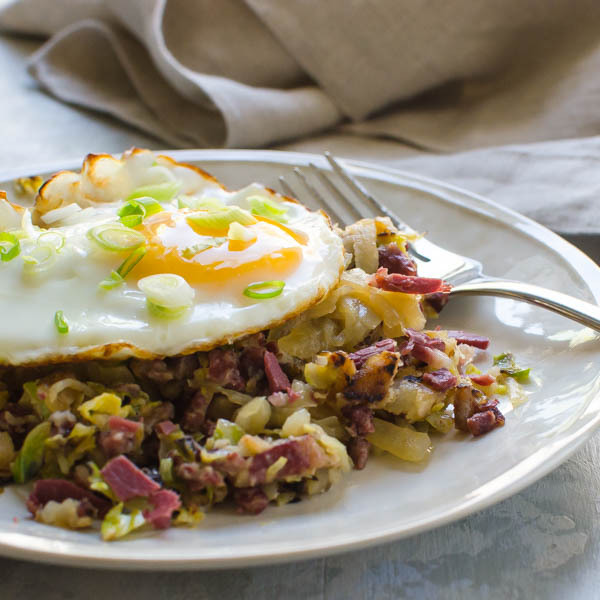 Put your leftover corned beef to good use in this hearty hash. 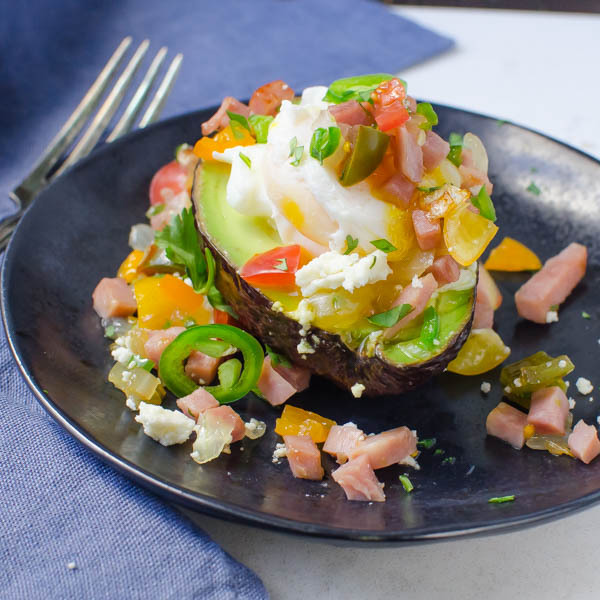 Great for a weekend brunch or quick and easy dinner. Sweet caramelized onions add another layer of flavor. Bring a large saucepan of water to a boil. 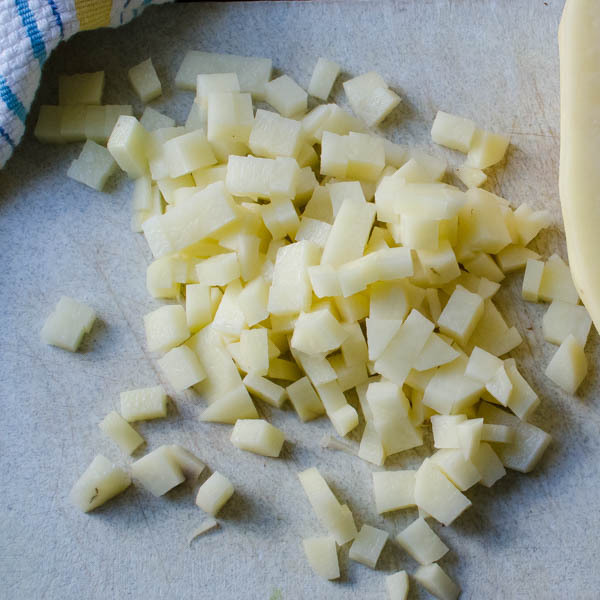 Add the salt and diced potatoes. Cook for 3 minutes or until just tender. Drain the potatoes and set aside. In a large skillet over medium-medium high heat, melt the butter in the skillet and add the potatoes. Cook for 2-3 minutes, stirring once to coat them with butter. Add the shaved brussel sprouts and cook for an additional 3-4 minutes until the potatoes and brussels start to take on some color. Add the corned beef and cream. Stir to combine and cook for 3-4 minutes until the mixture is very hot and the bottom and sides start to get crusty. 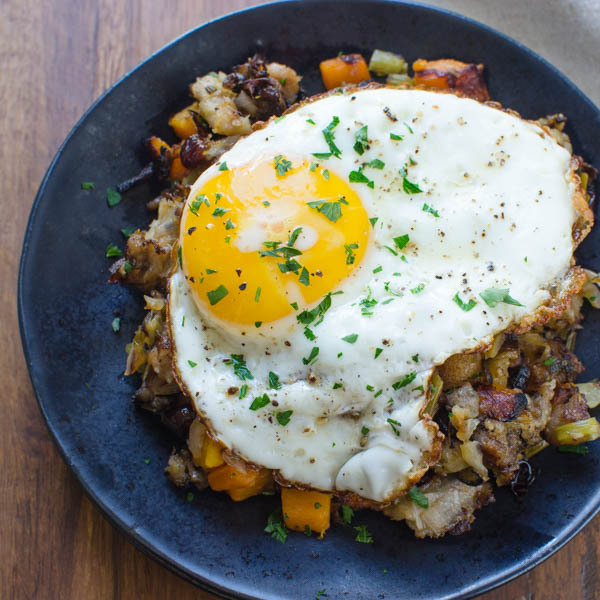 Spread the caramelized onions over the hash and top with a cooked egg (poached or fried the way you like it). Serve. I LOVE your unorthodox hash! Brussels sprouts are such a great addition and yeah, I’m so down with caramelized onions anytime. The textures and flavors are just wonderful. 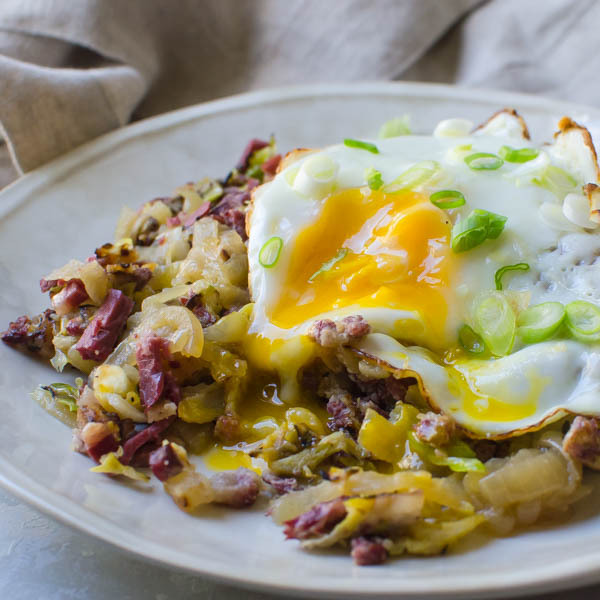 I’d definitely be “in” for some corned beef hash with brussels sprouts. They’re fantastic shaved and I can imagine that the flavor is a nice contrast with the corned beef and potatoes. Plus that yolk on top? Hello gorgeous. Oh wow genius! Sometimes when you have one plan in mind but then the contents of your fridge inspires something else, you end up with something even better! I think that’s the case with this dish! Helthifying the recipe is the worst… haha… Sorry, that was me being sarcastic 🙂 It’s actually the best! I love the addition of both the brussesls sprouts and the delicious caramelized onion. Oh, and that video is so lovely! I love love love the sizzle of the food hitting the oil that is in the background. Very appetizing! This is such a great way to use up leftovers from St. Patrick’s Day! Lol. I had to laugh at your husbands response. It definitely sounds like something my Dad would do. My husband is pretty picky, but he’s always open to at least *trying* things and sometimes he works past his fussiness and just eats. Other times, however, he makes the “yucky” face and peaces out. Oh well, more for me! This is still totally hash if you ask me. I’d totally still call it a hash! Although usually I’d be on your husband’s side with Brussels sprouts 😉 BUT actually I just had them shaved recently, and they were really delicious like that. Save a plate for me! 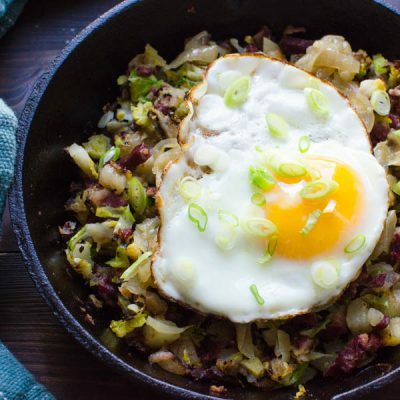 I love this version of corned beef hash! 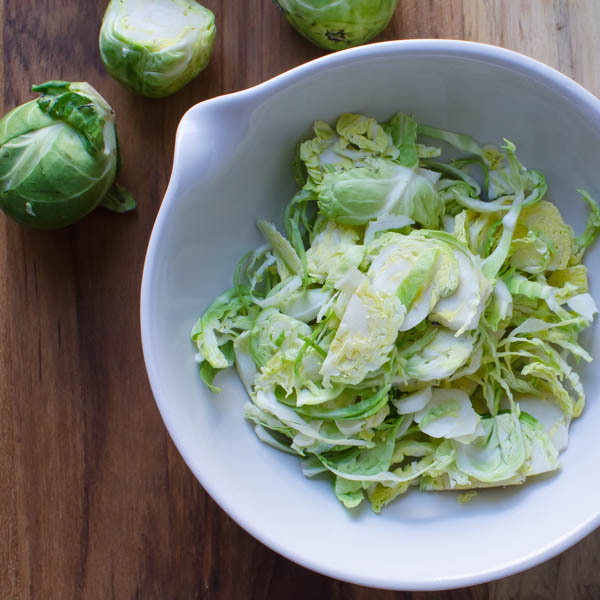 The Brussels sprouts addition is genius and the flavors are perfect together. 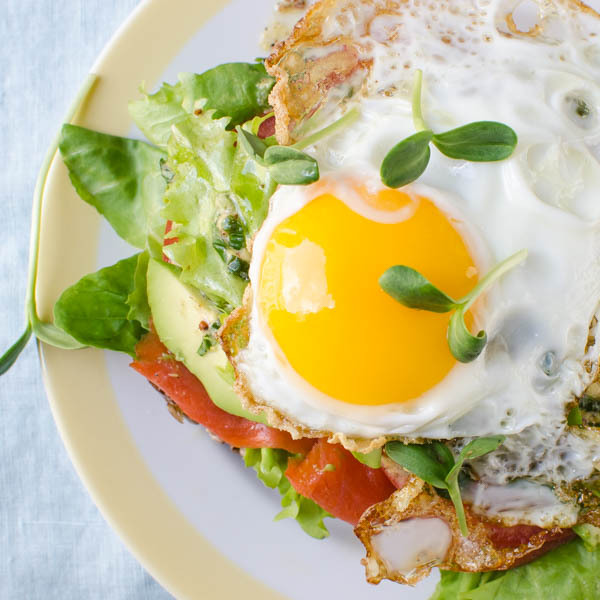 That sunny side up egg on top – YUM!! yes please! My husband does the same thing! I’m glad yours came around and asked for more. I’m on the brussels sprouts team. Since I was a kid I would ask my dad to make them. Lot’s of butter please. Your hash looks amazing. yummy! 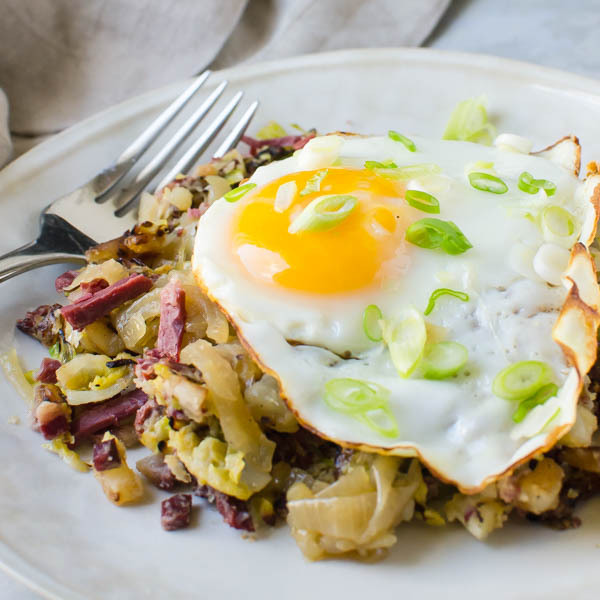 I got to try this corned Beef hash with shaved brussels! Love your photography , its making this recipe super attractive. Glad I’m not the only one, Traci! I was going to guess that he would come around and love this as soon as he gave this dish a chance! I love the addition of brussels sprouts here!